Theatre Royal and Opera House, Stockport, August, 1910. ​Central Theatre, Northwich, August, 1910. Theatre Royal, Barnsley, August, 1910. The Grand Theatre, Lancaster, August, 1910. Royalty Theatre, Barrow-in-Furness, September, 1910. Theatre Royal, Blyth, September, 1910. Alexandra Theatre, New Washington, September 1910. ​Theatre Royal, North Shields, October, 1910. Eden Theatre, Bishop Auckland, October, 1910. ​Alexandra Theatre, Birmingham, October, 1910. Theatre Royal, Tonypandy, South Wales, October, 1910. ​East Oxford Theatre, November, 1910. Palace Theatre, Ramsgate, November, 1910. ​Theatre Royal, Bury St Edmunds, November, 1910. Empire Theatre, Cradley Heath, November, 1910. 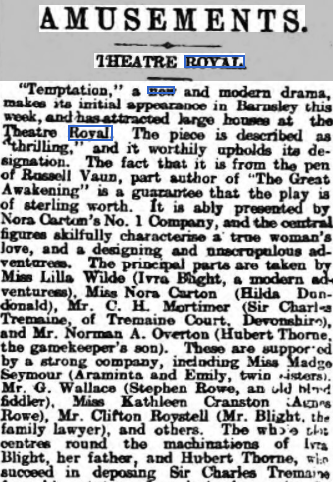 Theatre Royal, Glossop, December, 1910. ​Opera House, St Helens, December, 1910. ​Court Theatre, Warrington, December, 1910. Star Theatre, Swansea, January, 1911. ​Alexandra Theatre, Hull, January, 1911. Theatre Royal, Chesterfield in February, 1911. ​Metropole Theatre, Devonport in February, 1911. New Palace, Rugby in March 1921. He was rehearsing for the play in Ashton-under Lyme in July, 1910, according to The Era of 16 July, 1910. ​It is interesting to note that even during the tour, the management were still advertising for free weeks to be filled, usually in The Era newspaper, as can be seen below. From The Era of 8 October, 1910. From The Era of 12 November, 1910. ​East Oxford Theatre Co., Ltd.; Managing-Director, Mr. Frank Stuart.-"Temptation", as presented here this week by Miss Nora Carton's company, is attracting full and highly appreciative houses. The play is well acted, and the scenery and effects are much above the average. As Sir Charles Tremaine Mr. Charles H Mortimer is a great success; whilst a practical and forcible performance is that of Mr. Norman A, Overton as the villain Hubert Thorne; some able renderings are given by Mr. George Wallace and Stephen Howe, Mr. Claremont Gaskeit as Jacob Single, and Mr. Clifton Roystell as Mr. Blight; Mr. Frank Ayrton is a vivacious Bob Saunders; Hilda Dundonald as Miss Nora is graceful and unassuming; Miss Kathleen Cranston makes the most of the small and thankless part of Agnes Rowe; Miss Anna Beaumont quaint as Mrs. Oxen; Miss Madge Seymour negotiates the dual role of Araminta and Emily quite convincingly; and Miss Lilia Wilde scores undoubted success with her powerful study of Ivra Blight. From the Northwich Guardian of 23 October, 1910. From The Barnsley Chronicle of 20 August, 1910. From The Era of 3 September, 1910. Lancaster - Grand Theatre. Lessco and Manager, Mr. Stanlev Rogers; Acting Manager. Mr. E. C Howitt.—Temptation played by Nora Carton's company, is proving a big attraction this week. 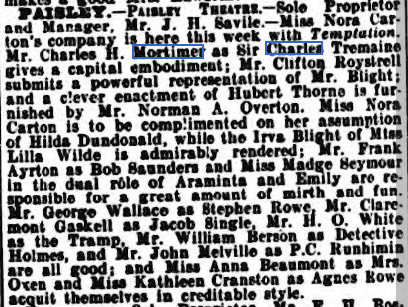 Mr. Charles H. Mortimer does full Justice to the part of Sir Charles Tremaine; as Mr. Bright, the lawyer, Mr. Clifton Roystell is successful; and Mr. Norman A. Overton as the villain, Hubert Thorne, gives a clever study. 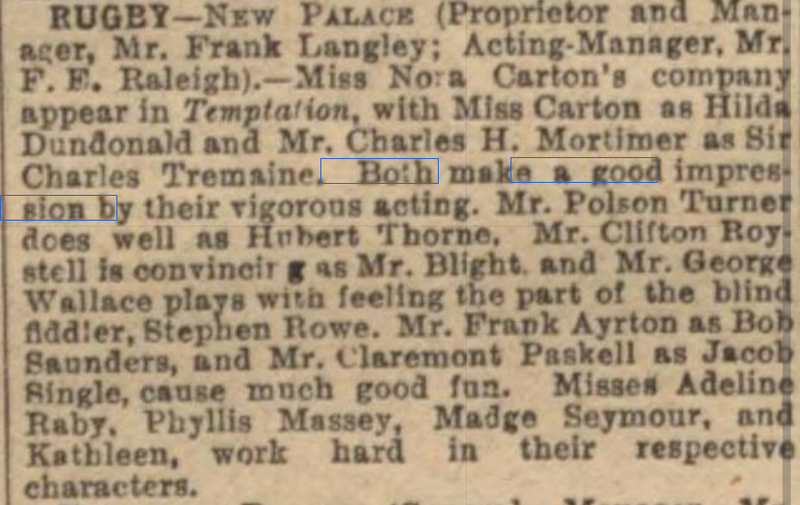 Miss Nora Carton is an excellent Hilda Dundonald; Miss Madge Seymour also scores as an adventuress; and Messrs. Frank Ayrton and George Wallace appear to advantage as Bob Saunders and Stephen Rowe respectively. From The Era of 25 September, 1910. BARROW-in-FURNESS. - Royalty Theatre Opera House.— Lessee and Manager, Mr. Hugh Robertson; Resident-Manager, Mr.George Stone.— Miss Nora Carton's company, in "Temptation", is here. Mr. Charles H Mortimer is excellent as Sir Charles Tremaine, and Mr. Clifton Roystell as Mr. Blight submits capital portrayal. Miss Lilia Wilde is a capable Ivra Blight, and Mr. Norman A. Overton does well as Hubert Thorne; Miss Nora Carton is good as Hilda Dundonald, and Mr. Frank Ayrton as Bob Saunders and Miss Madge Seymour as Araminta and Emily provide the fun. From The Era of 1 October, 1910. ​Washington — Alexandra Theatre - secretary, Mr. Joe Turnbull; Stage Manager, Mr. Ned Johnson. Miss Nora Carton has brought her No. 1 company here in the drama Temptation. 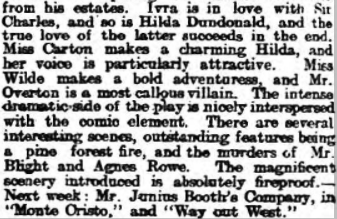 Miss Carton, in the role of Hilda Dundonald. is seen to advantage. Among the well-known artists who support her are Misses Lilia Wilde, Madge Seymour, Anna Beaamont, and Kathleen Cranston, and Messrs. Norman A. Overton, Charles H. Mortimer, Frank Ayrton, George Wallace, H.C White, Clifton Roystell. and Claremont Gaskell. Spennymoor.—Cambridge Theatre.-Leesee and Manager. Mr. Hugh Robertson. Resident- Manager. 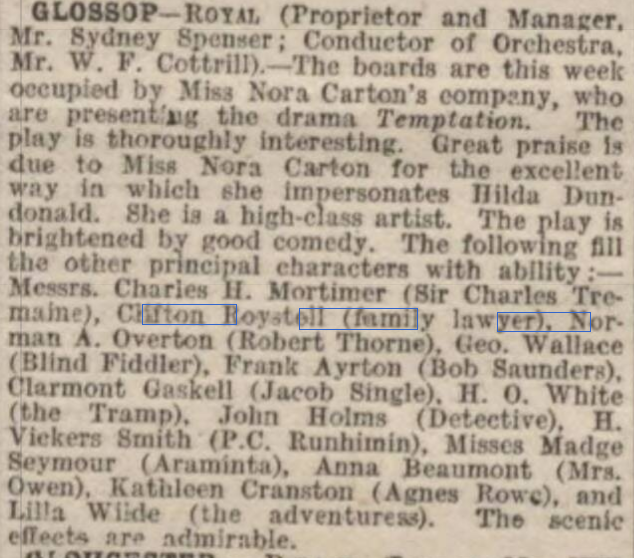 Mr. David Collins.—Miss Nora Carton's company appears here in "Temptation". 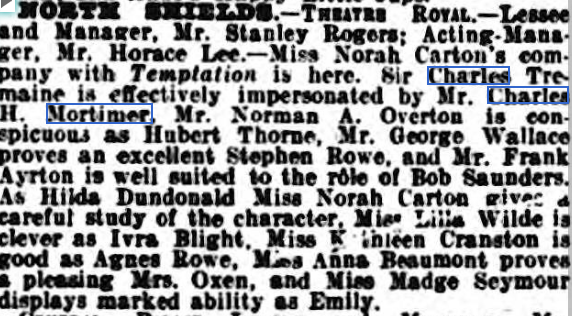 Mr. Charles H. Mortimer as Sir Charles Tremaine is a great success; Mr. Norman A. Overton in the role of Hubert Thorne acts with considerable effect; Mr. George Wallace in the part of Stephen Howe pleased the audience well; Mr. Frank Ayrton as Bob Saunders came in for much admiration; Miss Nora Carton was seen to advantage as Hilda; Miss Lilia Wilde made fascinating adventuress: Miss Madge Seymour made a capital Emily; and Miss Kathleen Cranston and Miss Anna Beaumont undertook their parts creditably. From The Shields Daily News, 13 October, 1910. ​From The Era of 13 August, 1910. Stockport. Theatre Royal and Opera House.—Sole Owner and Manager, Mr. Charles Revill; Acting Manager. Mr. Wm. Revill.— . 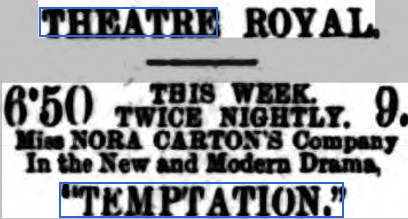 Temptation drama, which is brimful of interesting incidents and exciting situations, being capably presented by Miss Nora Carton’s company. Mr. Charles H. Mortimer acts with manliness as Sir Charles Tremaine; Hubert Thorne is effectively portrayed Norman. A. Overton; Mr Clifton Roystell looks and acts well the part of Mr. Blight; and Mr. Frank Ayrton as Bob Saunders capitally supported by Madge Seymour as Emily, is most amusing; Miss Nora Carton acts with sympathetic grace as Hilda Dundonald. and Miss Lilia Wilde's impersonation of Ivra Blight is excellent. Hull Daily Mail, 31 January, 1911 - Alexandra Theatre, Hull. A great many more of lesser degree. For sooth, a goodly company. No wonder the tramp who was commissioned to set alight the pine forest and "out Nero Nero” his opinion that Hubert was Napoleon and did things on a large scale. The gallery had the time of their lives. The great fight in the last act was the culminating point of their excitement. Advice was given to those on the stage —good advice, too —and the play ended with a very furore of applause and laughter. The comic relief is a strong point in this melodrama. The work well together. 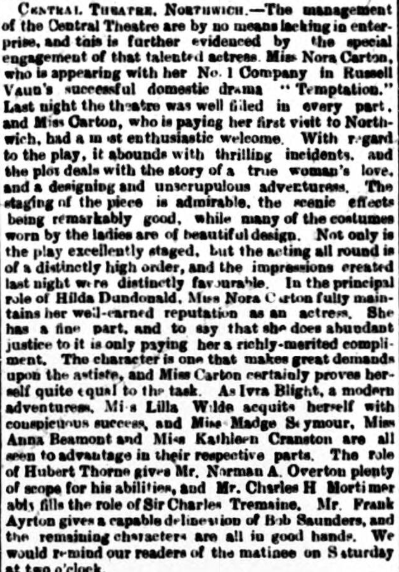 Miss Nora Carton, who has the only serious part in the play, Hilda, was a charming personality with a dreadfully plaintive voice. As a modem adventuress in the form and person of Ivra Blight, Miss Adeline Baby worked very well indeed, and Madge Seymour manipulated her two roles very cleverly. Of the male portion of the company much might be written, if it was really worth it. Jerroid Ord, as the villain was certainly entertaining, and "licked creation” with his big deal crimes. His repeated taking of drug in tabloid form, and his death from heart failure at the last because there are no more tabloids, led one to think that a good title for the play would be "Tabloid Drama." Mr Charles H. Mortimer, as Sir Charles Tremaine, has important stage presence, and the rank and file company fulfil their parts admirably. From The Derbyshire Courier of 28 February, 1911. The Theatre Royal melodrama, of the type of which Chesterfield audiences are particularly fond, has been heartily welcomed at the Chesterfield Theatre Royal this week. Temptation, is one of those pieces which abound in dramatic situations. Miss Adeline Raby, as an adventuress, has scored a decided triumph, whilst Miss Nora Carton made a charming heroine. Mr. Charles H. Mortimer plays the country baronet, and Mr. Jerrold Ord carried out the heavy role in first-rate style. The staging is up-to-date. For next week, brilliant drama dealing with life on the sea is to be produced by Mr. Charles M. Julian’s Company. “Captain Jack.” as it called, is something new to Chesterfield, and is sure to draw. From The Stage of 9 March, 1911.